This sounds easy, right? Go see some rocks and fossil locations, bring back some samples of t-rex teeth or a photo of some crazy rock – how hard is that?!! Well, bear in mind that this country is fairly big. And also massively empty of people. So inevitably, these locations are far away from me. Far away from anyone really. To say that they are remote is a bit of an understatement. Go the back of beyond, turn right and keep on going. So which sites would I like to see and why? 1. Ediacara Fauna. Flinders Ranges, South Australia. This is the site of the discovery of the oldest multicellular animal fossils and totally changes our understanding of the beginning and timing of evolution of life on this earth. These crazy fossils are around 600 million years old and represent the start of the explosion of life into the oceans. Amazing stuff. But its a long way. 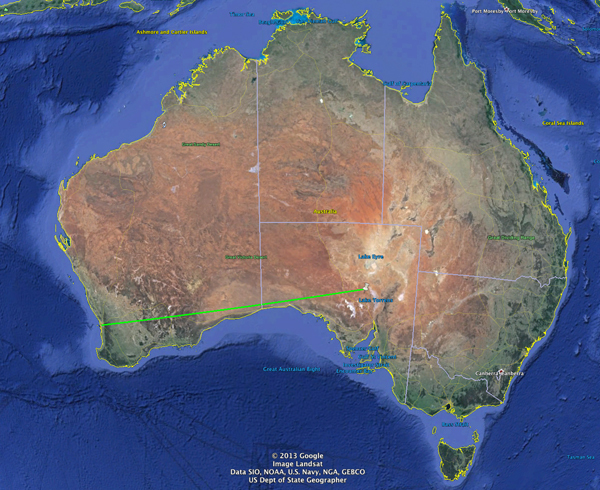 2000km in a straight line – which is of course not even remotely possible in this inhospitable place. Woo – a local site! Well, not really local – at least 850km away from where I live – at least to the nearest town. 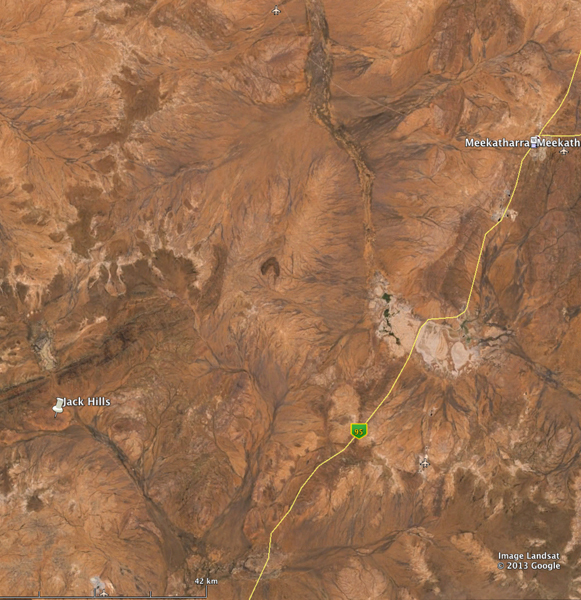 The good news, is that it’s tarmac road almost all the way to the nearest town, Meekkatharra, but the bad news is the Jack Hills are at least 100km west of civilisation, roads, water, anything. But at least its not crazy middle of desert. So whats so special about the Jack Hills? Well, the oldest rock in the world was found there. To be a little more specific, a zircon grain in a 3.5 billion year old metamorphosed sedimentary conglomerate was dated at 4.4billion years old. Thats only a few hundred million years after the earth was formed. The 3.5 billion year old rock, although a BILLION years younger than grains of older rock that were eroded and laid down in some kind of river system, is still some of the oldest rock (not just teeny crystal) on this planet. The other crazy thing is those 4.4 billion year old zircons were thought to have formed in water – much earlier than geologists had previously thought. So worth standing there and pausing for thought, I reckon. 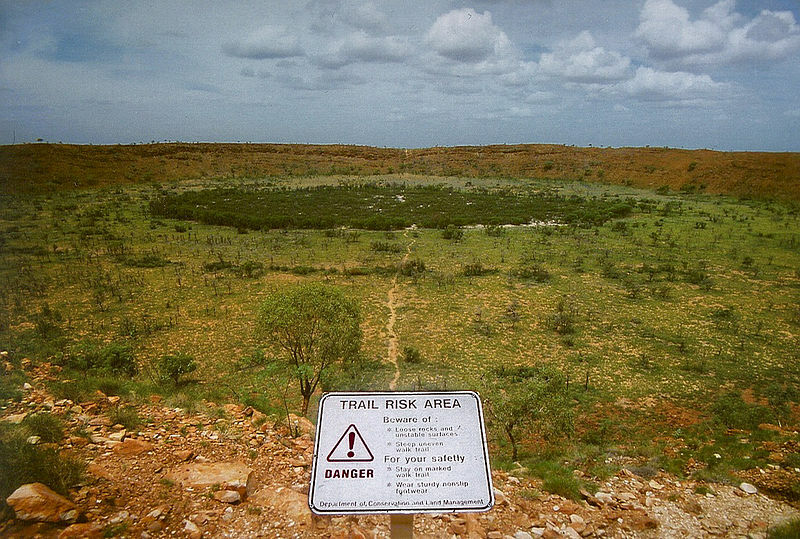 As luck would have it, on the way to the Jack Hills is a meteorite impact crater. Another meteorite impact crater, but a different scale and age entirely. It’s 30km in diameter and over 1.7billion years old (impacting into 2.5billion year old granite) I don’t know how much is left on the surface, but it’s pretty obvious from google earth, so it has to worth a visit. If only, like before, to wonder at the vast spans of time that are represented here. The biggest rock in Australia. Bigger than Ururu/Ayres Rock, just a lot less accessible and significantly less controversial in terms of Aboriginal land rights and cultural significance. It’s also not in such flat desert landscape, so it doesn’t quite have that ‘big red rock in the middle of nothing’ feel. But it’s still pretty impressive and relatively accessible. By relatively, I mean ‘requires serious planning’ and out in the middle of nowhere, but it is a national park and theres a ‘nearby’ cattle station that offers camping and fuel. 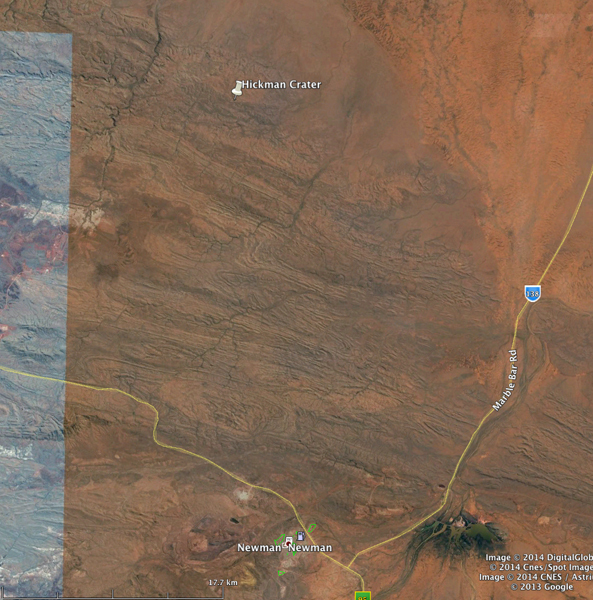 As you can see from the map, it’s a serious way off the main tarmac highways. Definitely a place to visit then. 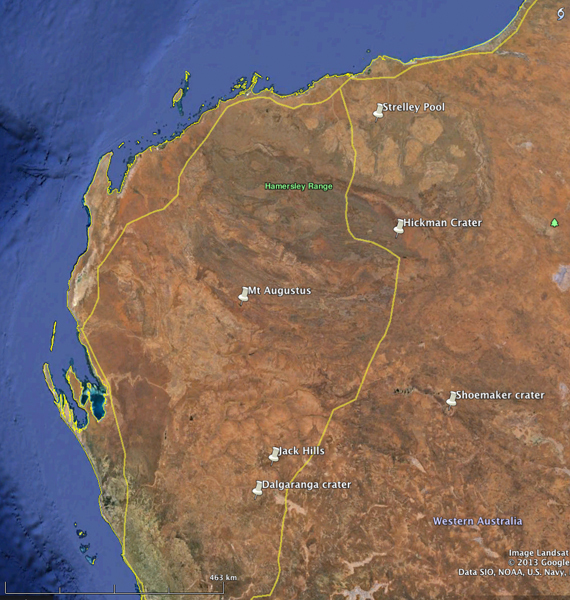 On the face of it, its not too far away from Newman and also the Rio Tinto iron ore operations at Hope Downs, but get closer on the map and it’s really in the middle of nowhere (funny that). The crater is about 260 metres wide and 30 metres deep, and is thought to be between 10,000 and 100,000 years old and was discovered by chance by a geologist browsing Google Earth, no less. This is going to be a tough one – it’s a very long way away from Perth and in one of the hottest areas of Australia – Marble Bar regularly gets summers with temperatures in the high 40’s centigrade – ouch. But the Strelley Pool area has to worth a visit as it is home to the very oldest fossils on Earth. For the 3 billion years between the formation of a stable earth capable of supporting any kind of life and the start of complex multicellular life as seen in the Ediacara fauna, the only thing that existed were bacterial and algal colonies such as Stromatolites. Stromatolites can still be seen today – I visited them at Hamelin Pool in Shark Bay a few years ago – amazing to think these simple things have survived unchanged for so long – an enduring reminder that some things just work. These remarkable creatures are thought to be single handedly responsible for oxygenating the atmosphere over those billions of years. Crazy huh? So, Strelley Pool has some examples of the oldest fossils found on Earth – Stromatolites and algal mats, preserved in highly metamorphosed chert. They are impossibly old – 3.4 billion years old – as old as the conglomerates in the Jack Hills. Thats got to be worth a look. And again, a pause for reflection. The only problem is that Trendall Locality (as it is known) near Strelley Pool, although it has dirt roads from a nearby mine site, its in the middle of nowhere, so it’s going to take some planning! Now we’re miles from home, let me introduce the last 2 localities. Home to the racily named Gogo Formation – a Devonian (380MY) rock formation where deep water oxygen deficient sedimentation means that fossils are preserved with lots of fine detail – including a fossil placoderm (plate skinned fish) giving birth to live young. So that has to be worth a look. Its helpfully accessible from the town of Fitzroy Crossing too – you just have to get there first – its further away from Perth as the Flinders Ranges in South Australia where the Ediacara Fauna is!.. 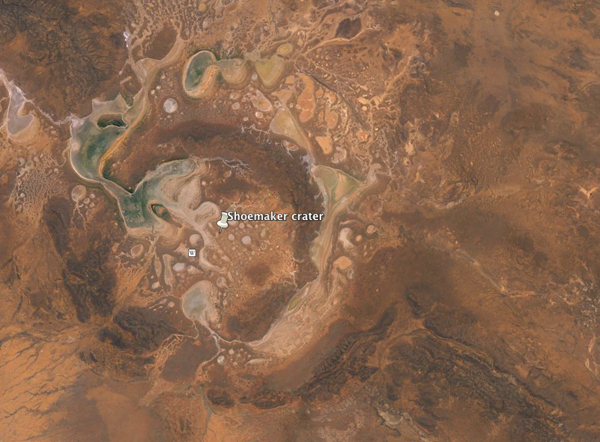 As featured in the 2005 horror film Wolf Creek (yes, they got the name wrong) – this is a very well preserved impact crater that has to worth a visit. It’s in the middle of nowhere (really, imagine that) but it’s sufficiently interesting that I think it’s worth the effort trying to see it. It’s not that far from Fossil Downs, so hopefully its doable! It’s 300,000 years old, which explains why it’s relatively well preserved. Now there are a ton of other general touristy places that I want to see – The Karijini National Park in the Pilbara with its gorges and canyons, the Bungle Bungles with its crazy banded iron formation beehive hills – I could go on. And there will be, on closer investigation of these locations, new geological locations that come up too – so expect the list to grow a bit. So there you go – this is the foundation of my adventure – from the oldest rocks on earth to the oldest fossils, the first evidence of the explosion of life to fossils showing incredible detail – all peppered with impact craters. Fantastic. 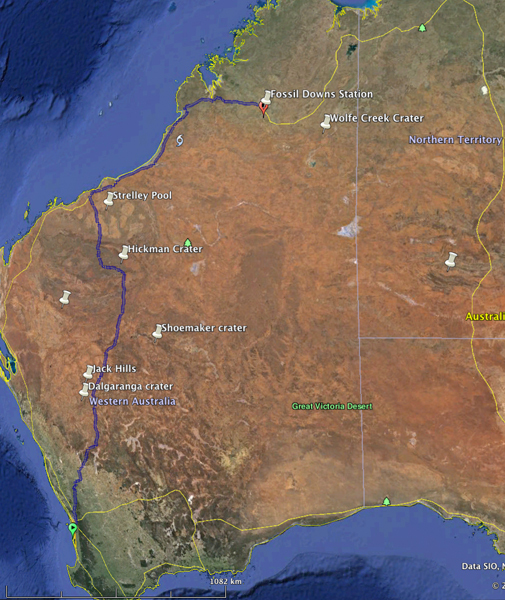 I’ve seen 2 of your list – Mt Augustus and Wolf Creek Crater – and have harboured a desire to go see Ediacara Fauna and Fossil Downs for much the same reasons (a nerd by any other name..). You need a support vehicle driven by a couple of nerds on this epic adventure? That sounds like a fantastic list! Some really fascinating places to visit. 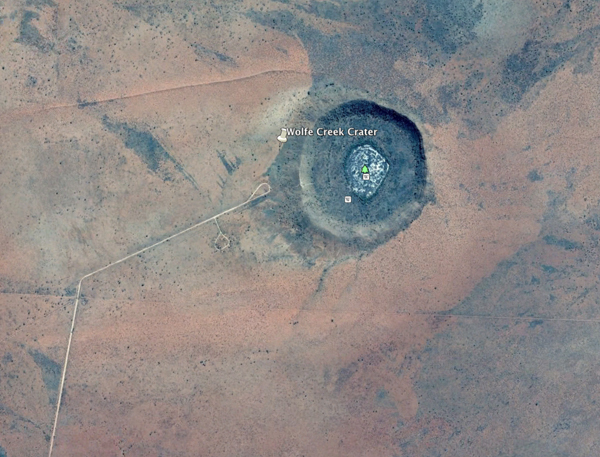 I certainly wouldn’t mind seeing a few of them (I can’t decide whether the Edicara Fauna or the Wolfe Creek crater appeals to me most). So good luck with it! The Shoemaker of Shoemaker crater, any relation to the Shoemaker of Shoemaker-Levy comet fame do you happen to know? Hey Lance – I think there a time when a man needs a proper adventure list! You’ve been doing it proud on your end, but I’m kinda letting things down over here! I can imagine how you’d write about visiting these places too – it would be awesome! Wolfe Creek is pretty impressive, but there’s something amazing about standing on the place where the first multicellular life appeared – depending on what you believe – these could be our ancestors! You know that the Ediacara fauna was first described in rocks in the Charnwood forest? Thats something that you can go see pretty easily! That’s a very good point about Charnwood. In fact, a very good point indeed…hmmm, I think you’ve just inspired me! I first heard about Charnwood from our friend David Attenborough. Fascinating place, I’m sure. So I really should make it over there. I know what you mean about how awe-inspiring the Ediacara fauna are. Very humbling to think about their place in our history (whether directly or not).